I came into playing Hyperdimension Neptunia: Producing Perfection with pretty much no idea what to expect. I'd been told about a series of RPGs with ridiculously hilarious attacks featuring Megaman creator Keiji Inafune's face. Instead I got an idol simulator, and you know what? That's alright. 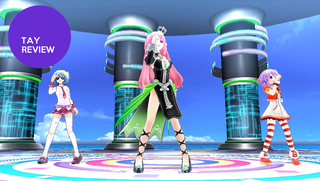 Hyperdimension Neptunia PP puts you in the role of manager of one of four CPUs, or goddesses, as they explain themselves to you: Neptunia, Noire, Blanc and Vert. The latter three rule the lands of Lastation, Lowee and Leanbox, respectively. See where this is going? Hyperdimension's story is essentially an alternate-world retelling of the console wars in which the consoles team up to bring shares, or fans, back from idols thus restoring their powers, by becoming idols themselves. It's an interesting premise that adds a little bit of depth to the idol simulator. Hyperdimension's characters all feel like standard anime tropes, but that's not necessarily a bad thing. I personally preferred Noire's tsundere personality to those of her rivals. Plus, she represents PlayStation and this game is on Vita, so why not? Each CPU has a little sister as well, who seems to find ways to interfere in your efforts to train them into a top idol. Interactions with the little sisters typically end violently and are always hilarious. When I play my Vita, I typically play at home, from the comfort of my couch. Most portable games just don't have that pick-up-and-play quality present in mobile games. Hyperdimension Neptunia, however, is a game that's easy to treat as you would you favorite iPhone game. Your training sessions with your chosen CPU are split into 180 days, with each day taking just a minute or so to complete, excluding those in which you do concerts, which don't really tack a whole lot of time on. It's easy to pick this game up on the train or on your way somewhere and knock out a few days worth of idol training, then just put it down until you have time. The ability to do that is something I feel is missing in too many portable games and is very welcome. At just five songs, get prepared to hear the same tunes over and over again as you progress through Hyperdimension's idol training. If you're a fan of the genre, your music choices will feel further limited by the fact that you can't use your idol's CPU mode, in which they transform into their more powerful—or in this case, more attractive— mode in order to further excite their fans in all but one song per CPU at the onset. Hyperdimension Neptunia: Producing Perfection is a fun game that captures that mobile game feeling on a traditional handheld. It's the first game in a while that made me feel like throwing my Vita in my bag for quick sessions in between life's daily activities. If you're the type of person that likes idol games and moe characters, Neptunia is a no-brainer. If you aren't, give it a try anyway, you might be as surprised as I was.